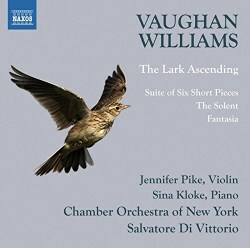 For many listeners, the main motivation for purchasing this CD will be The Lark Ascending. The highly-regarded violinist Jennifer Pike and the Chamber Orchestra of New York give a fine performance of this extremely popular work. It presents the shimmering, impressionistic ‘all the live murmur of a summer’s day’ mood that this work demands. I confess that my bench-mark will always be Hugh Bean’s magical account with the New Philharmonia under Sir Adrian Boult. However, Pike’s performance will prove a success. The remainder of the works on this disc are much less prevalent. I first became aware of The Solent when I purchased Sir Adrian Boult’s splendid recording of RVW’s Symphony No. 9 on EMI LP ASD2581. That would have been around 1973. Reading the sleeve-notes, I discovered that ‘the second movement [of that symphony] begins with a theme for flügelhorn which came from an unpublished tone-poem The Solent (composed 1903) and is also used in the Sea Symphony.’ At that time, I could find precious little information about this work. The title stirred my imagination, but I guess I felt that I would never hear this ‘early horror’. In the past decade or so, several withdrawn works have been released. The Solent appeared on Albion Records ALBCD016 in 2013. It was coupled with two other ‘mislaid’ tone poems – Burley Heath and Harnham Down. Like many RVW enthusiasts, I was not disappointed by these pieces and felt that they had been well worth the wait. The Solent is a reflective and introverted work that was meant to be part of a larger suite, In the New Forest. Aesthetically, it is a million miles away from the notion of happy holidays by the sea at Ryde, Southsea or Cowes. In fact, the score is prefaced with the text by Philip Marston (1850-87): ‘Passion and sorrow in the deep sea’s voice, A mighty mystery saddening all the wind.’ I am delighted to have another splendid version of this long-awaited tone poem. Vaughan Williams is not usually acknowledged for his piano music. Virtually all the original pieces, as opposed to arrangements, could be included on one side of an old vinyl LP. Glancing at Michael Kennedy’s catalogue shows a few ‘occasional’ pieces: Birthday Gifts, Hymn Tune Prelude on Song 13, Introduction and Fugue for two pianos, Six Teaching Pieces, The Lake in the Mountains, an arrangement of Chorale Prelude ‘Ach bleib' bei uns, Herr Jesu Christ’, BWV 649, transcribed for piano and the Suite of Six Short Pieces for piano. I am curious as to how this present Suite can be billed on the album cover as a “world premiere recording”. To my understanding this short work was released on a vinyl LP by Peter Jacobs in 1981 (Phoenix DGS1019), and then re-issued on audio-cassette (TRXC126) and CD (TRX CD126). Interestingly, this LP was engineered to be played at 45rpm as opposed to the traditional 33rpm. I never owned or heard that album. As it turns out another disc of the piano music is to appear in January 2017 from Mark Bebbington and Rebeca Omordia on Somm SOMMCD 0164. The Suite was designed for teaching purposes although I agree with the writer of the liner-notes that it deserves to be recognised as a recital work. It has six movements: Prelude, Slow Dance, Quick Dance, Slow Air, Rondo and Pezzo Ostinato. The music is neo-classical in mood, although the ‘slow air’ does reflect the composer’s popularly perceived style. The rondo seems to hint at the song Linden Lea. All six pieces are played with subtlety and conviction by Sina Kloke. The Suite is better-known in its arrangement by the composer and James Brown as the Charterhouse Suite. This has been recorded several times, including on Naxos 8.555068. The title harks back to RVW's days at Charterhouse School in Godalming. The Fantasia (Fantasy) for piano and orchestra, does not seem to have quite made it into the ‘popular’ Vaughan Williams repertoire. Two reasons spring to mind. Firstly, it remained unheard until 2011 having been rediscovered by the pianist Mark Bebbington in 2010. It was released the following year on SOMM SOMMCD 246. The second reason is that the sound-world of this piece owes little to the ‘received’ ideas of what the ‘Englishness’ of the composer’s music implies. The Fantasia was begun in October 1896, when RVW had returned to the Royal College of Music to study with Stanford. During this time, plenty of other works were written, including the Heroic Elegy, the Bucolic Suite and The Garden of Proserpine (Albion ALBCD012). Many of these have now been issued on CD. The Fantasia was completed on 9 February 1902 and was revised twice in 1904 when the score was laid aside and deposited in the British Library with the word ‘withdrawn’ written on the cover. It is not known if the work was composed with a soloist in mind: it seems never to have been performed until Mark Bebbington took it up. The exemplars of the Fantasia are largely nineteenth century, including Brahms, Wagner, Delius and RVW's teacher Stanford, although just occasionally the listener will be struck by a phrase that seems closer to what we expect of the composer of the Tallis Fantasia or The Lark Ascending. The Fantasia is presented as a single movement work lasting for just over twenty minutes. It is cast in six contrasting sections. The listener will be impressed with the ‘bravura’ Brahmsian pianism which is well-played by Sina Kloke. It is a work which is very much of its time, but is none the worse for that. It deserves its place in the composer’s catalogue of recorded music. The score was subsequently edited for performance by Graham Parlett, and was published in 2012. The booklet notes by Paul Conway are outstanding, giving a good overview of RVW's ‘early horrors’ which have now become part of the composer’s legacy. I enjoyed this new CD from Naxos. The choice of repertoire is interesting, although I am not sure about the mix of orchestral and piano pieces on the same CD. The playing is excellent and reflects a great sympathy towards English music by this orchestra from New York.